Kings of War has lots of unit types that are not covered by Mantic Games models, the company that produces the game. I've collected some ideas, model suggestions, what kind of miniatures could be used for the different Kings of War units types. If you click on the unit name you can get the full list of miniatures we have in our database that belong to that unit type. Also, there are some creatures that are not covered by Kings of War army lists - for these we are trying to provide proxy army ideas. Base size: If you don't multibase your Kings of War miniatures, these are the legal base sizes. Miniature height: The Kings of War rules differentiate between five size categories. When looking for miniatures, it's good to keep this in mind. Height 0: 0-2cm high. Very small units, small animals. Height 1: 2-4cm high. Normal infantry units, war engines. Height 2: 4-6cm high. Large infantry, normal cavalry units. Height 3: 6-12cm high. Giants, monsters, large cavalry units. Height 4: 12-16cm high. Giants, large monsters. 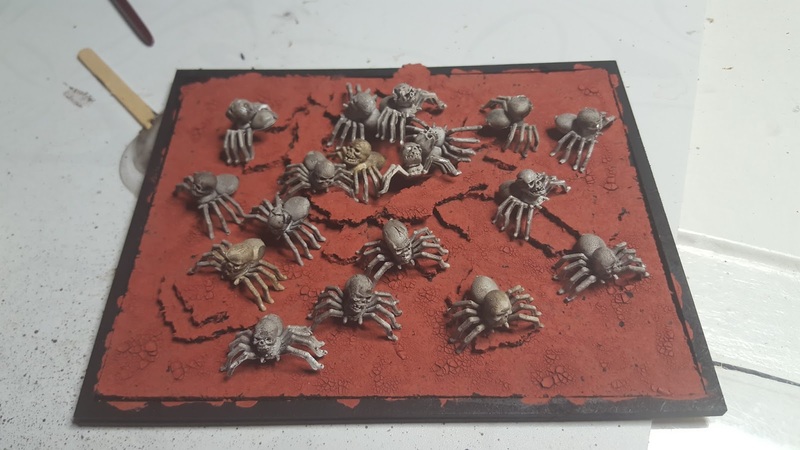 Petersen Games / Fenris Games - Cthulhu Wars - Summoning Gate: 90mm diameter. Gargoyle * : Small, flying humanoid creature. Abyssal Guard: A Lower Abyssal (humanoid creature with scary, inhuman features) elite in a ceremonial armour, with a powerful weapon and a shield. Abyssal Guard with two-handed weapon: A Lower Abyssal (humanoid creature with scary, inhuman features) elite in a ceremonial armour, with a powerful two-handed weapon, without shield. Flamebearer: A Lower Abyssal (humanoid creature with scary, inhuman features) imbued with fire magic. Fleshling: Human with one-handed melee weapon and shield. Fleshling with two-handed weapon: Human with two-handed weapon. Larvae *: Shambling, tortured mortals bundled together in a mass of wailing soul-vessels. Lower Abyssal : A humanoid creature with scary, inhuman features. Imp * : Small, mischievous humanoid Homunculi creature, a vicious monster. Tortured Soul: Its an adventurer, stripped of its identity, it is little more than a beast. It's Shambling, but it can Fly. Hellhound : A quadruped carnivore with three heads. Abyssal Horseman : Heavily armoured rider, armed with a lance or a two-handed weapon. Gargoyle* : Small, flying humanoid creature. Abyssal Halfbreed: Debased monstrosity, product of an insane crossbreeding experiment. Often has a body of a quadrupedal Abyssal creature, and the upper torso of a Dwarf. Abyssal Halfbreed Champion: The greatest of the Abyssal Halfbreeds (debased monstrosity, product of an insane crossbreeding experiment. Often has a body of a quadrupedal Abyssal creature, and the upper torso of a Dwarf), armed with two-handed hammer or an axe. Man-at-Arms (sword & shield) : Armoured human warrior with sword and shield. Man-at-Arms (spear & shield) : Armoured human warrior with spear and shield. Crossbowman : Armoured human warrior with crossbow. Perry Miniatures - Agincourt English Bowman: Possible proxy. Penitents Mob : Human penitent lunatic, with a one-handed melee weapon. Paladin Foot Guard : Heavily armoured human warrior with one-handed melee weapon and shield. Paladin Foot Guard with two handed weapon : Heavily armoured human warrior with two handed weapon and no shield. Sisterhood Infantry : Female human warrior with one-handed melee weapon. Paladin Knight : Heavily armoured human warrior with one-handed melee weapon and shield, mounted on a barded warhorse. Sisterhood Panther Lancer : Female human warrior with one-handed melee weapon, mounted on a giant panther. Elohi : Armoured large winged angel warrior with one-handed melee weapon. Dictator : Armoured, wise and charismatic old man. Bearer of the Holy Icon : A young acolyte with a holy icon (statue of a saint or hero, battle-flag). Priest : Armoured human priest with one-handed melee weapon. High Paladin : Heavily armoured human warrior with one-handed melee weapon and shield. Abbess : Female leader of the Sisterhood. War-Wizard : A human magic user. Dictator on Warhorse : A Dictator (armoured, wise and charismatic old man), mounted on a warhorse. Bearer of the Holy Icon on Horse : A Bearer of the Holy Icon (young acolyte with a holy icon (statue of a saint or hero, battle-flag)), mounted on a barded horse. Priest on Horse : A Priest (armoured human priest with one-handed melee weapon), mounted on a horse. Ur-Elohi : A large winged angel with a flaming sword. Samacris  : A female large winged angel. Dwarf: A strong, stout, barrel-chested humanoid, with large hands, and heads that are set forwards. They have long hair and beards. They stand shoulder-height to a human. Dwarven Throwing Mastiff: A vicious war-dog. Berserker: A Dwarf, that is a frenzied lunatic. Kromlech - Dwarf - Desperate Housewives: Female alternatives to the usually male berserkers. Bulwarker: A heavily armoured Dwarf warrior armed with a long spear. Ironclad: A Dwarf warrior, armed with axes and hammers. Ironguard: A Dwarf veteran warrior, armed with a shield and a one-handed melee weapon. Avatars of War - Dwarf - Doomcrusher: Will require some work as the minis have two-handed weapons. Ironguard with two-handed weapon: A Dwarf veteran warrior, wieding a two-handed weapon, no shield. Ironwatch Crossbow: An old and fat Dwarf, armed with a crossbow. Ironwatch Rifle: An old and fat Dwarf, armed with a rifle. Ranger: A young Dwarf scout, armed with a one-handed melee weapon and a light crossbow. A ranger is a speclalist in ambush warfare. Mantic Games - Kings of War - Dwarfs - Ironwatch Crossbow: The official miniature, although doesn't look particularly young. Mantic Games - Kings of War - Dwarfs - Shieldbreaker with two-handed hammer: The official miniature, although doesn't look like a scout. Shieldbreaker: A strong Ironclad (a Dwarf warrior) with a two-handed weapon. Sharpshooter: An apprentice Dwarf Warsmith, armed with a mastercraft long rifle. The rifle is very long, it requires a 25x50mm base. Berserker Brock Rider: A Berserker, riding a vicious mount. Rackham Miniatures - Confrontation - Dwarfs of Tir-Nа-Bor - Khor Knights of Uren: The riders don't fit the Berserker theme. The Assault Group - Dwarf Cavalry: The riders don't look like berserkers, but the ponies could be useful. Mounts: These mounts don't have a dwarf rider so it will be some work to fit one. Ramshackle Games - Orc Dunger Riders: The riders are casted together with the dungers, so it will involve some work to put dwarves on the dungers. Ironbelcher Cannon: A cannon that fires cannonballs. Flame Belcher: Warmachine that belches flammable liquid. Jarrun Bombard: A bombard that can be fired directly forward, or indirectly like a mortar. Steel Behemoth: Innovative fighting vehicle, powered by internal combustion engine. It's protected by metal plates, equipped with flame-spitting weapons. Ironclad Miniatures - Steam22 Steam Tank: Needs a flamethrower. Berserker Lord: A Berserker (frenzied lunatic), nigh-unstoppable killing machine, usually wielding a pair of magical axes. King: A noble ruler, mighty warrior, bearing magical rune-encrusted weapons and armour. Berserker Lord on a Brock: A Berserker Lord (frenzied lunatic, nigh-unstoppable killing machine, usually wielding a pair of magical axes), riding a vicious mount. Sveri Egilax : A Berserker King, riding a vicious creature. King on Large Beast: A King (noble ruler, mighty warrior, bearing magical rune-encrusted weapons and armour), riding a large rodent or other burrowing creature. Hunters of the Wild: Wild and untamed fey creature of the forest. Servants of the Green Lady. Spirits and fairy folk. Gnomes, fauns, will o' the wisps, dryads, sprites. Forest Shambler: Construct of wood, foliage, mud and stone, animated by ancient spirits.. Great tree. Forest Warden: Ancient, massive woodland guardian. Tree Herder: Mighty wooden giant. Forces of Nature - Wild Companion: A feral animal, bound to its master. Elemental - Air: Entity of raw energy, a swirling tornado. Activision - Skylanders - Flashwing Ed1: Dragon. Activision - Skylanders - Flashwing Lightcore: Dragon. Activision - Skylanders - Flashwing - Jade Flashwing: Dragon. Activision - Skylanders - Scratch: Winged cat. Activision - Skylanders - Sonic Boom Ed1: Dragon. Activision - Skylanders - Sonic Boom Series 2: Dragon. Activision - Skylanders - Warnado: Dragon. Activision - Skylanders - Warnado Lightcore: Dragon. Activision - Skylanders - Whirlwind Ed1: Dragon. Activision - Skylanders - Whirlwind Series 2: Dragon. Activision - Skylanders - Whirlwind - Polar Whirlwind: Dragon. Activision - Skylanders - Whirlwind - Horn Blast Whirlwind: Dragon. Activision - Skylanders - Whirlwind - Breeze: Kid dragon. Elemental - Earth: Entity of raw energy, a goliath of rock and dirt. Activision - Skylanders - Bash - Bop: Probably not a "goliath of rock", but could be a good addition as an elemental kid. Activision - Skylanders - Rocky Roll: If you are going for a serious look, the miner helmet might need to go. Large monster miniatures: These look earthy enough. Elemental - Fire: Entity of raw energy, a warrior of fire and lava. Activision - Skylanders - Eruptor - Weeruptor: In case you'd ever need a fire warrior kid. Elemental - Water: Entity of raw energy, a sentient tidal wave. Large water creature miniatures: They could be used as water elementals. Beast of Nature: Terrifying mix of Chimera, Sphinx, Manticore and other monsters. Beast of Nature with Fly: Terrifying mix of Chimera, Sphinx, Manticore and other monsters, that can fly. Greater Elemental - Air: Entity of raw energy, a living thunderstorm. Greater Elemental - Earth: Entity of raw energy, a walking mountain. Huge underground creature miniatures: They could be used as earth elementals. Huge creatures: These are earthy enough, so they could be fitting. Greater Elemental - Fire: Entity of raw energy, a monstrous sentinel of flame. Greater Elemental - Water: Entity of raw energy, an aqueous giant. Huge water creature miniatures: They could be used as water elementals. Hydra: Massive reptilian form with multiple heads. Druid: A powerful and mysterious man. Druid on mount: A Druid (a powerful and mysterious man) riding a horse, stag, lesser unicorn, or similar mount. WarGamma - Oak Lord: Doesn't look benign, but it's a good model. Goblin Rabble : A small humanoid creature with one-handed melee weapons. Goblin Spitter : A small humanoid creature with bow. Goblin Sharpstick : A small humanoid creature with a spear. Goblin Fleabag Rider : A Goblin Sharpstick (small humanoid creature with a spear), riding a small, but vicious quadruped carnivore. Big Rock Thrower: A catapult. Shield Wall : Human warrior in light armour with one-handed melee weapon and shield. Foot Guard : Elite human warrior using high quality one-handed melee weapon, shield and armour. Foot Guard with two handed weapon : A Foot Guard (elite human warrior) using high quality two handed weapon and armour. Pike Block : Human warrior with long pike, held in two hands, fighting in phalanx formation. Heavy Pike Block : Human warrior in very heavy armour, with a long pike, held in two hands, fighting in phalanx formation. Spear Phalanx : Human warrior with spear and shield, fighting in phalanx formation. Pole-Arms Block : Human warrior with a polearm. Militia Mob* : Human warrior, badly equipped, in disorganized formation. Berserker : Savage human warrior without armour. Bowman : Human warrior with bow. Crossbowman : Human warrior with crossbow. Arquebusier : Human warrior with arquebus (rifle). General : Human leader, in very heavy armour. Hero : Heroic human warrior, in very heavy armour. Army Standard Bearer : Human warrior in armour, with the large banner of the army. Wizard : Human magic-user, in heavy protection. The Captain  : Human leader, in very heavy armour. Blood Worm: Giant, slimy worm. Phantom: Cloaked, floating (Flying) creature, with partially hooded head. Needlefang: It can form a black tide of crawling, shapeless things. 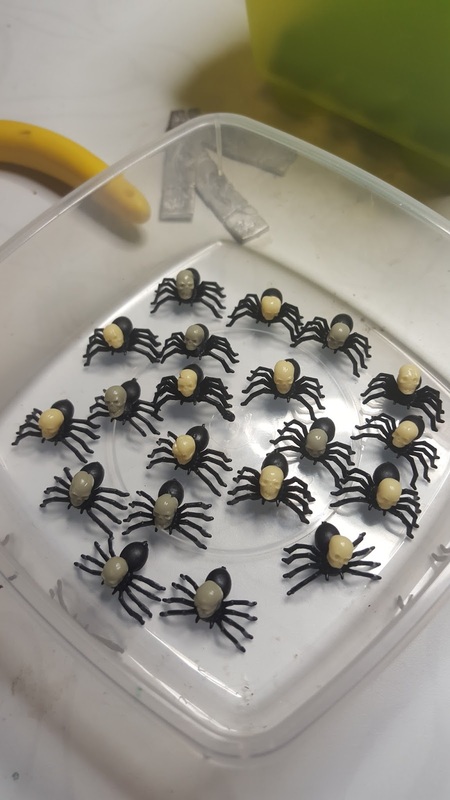 Halloween spiders with skulls on their body. Image 1, Image 2. Butcher: They appear as hybrids of ogre, golem and squid, wielding cleavers in their many hands. Mierce Miniatures - Ysians - Brutes of Ys, Brute Unit: Although not cleavers, but their weapons are brutal enough. Mantic Games - Deadzone - Plague - Stage 1: Basic miniature, without the cleavers. Mantic Games - Deadzone - Plague - Stage 2: Basic miniature, without the cleavers. Shadowhound: Huge, black, twin-headed canine. Three-headed wolf miniatures: These have 3 heads, so you either accept it or remove one of them. Fiend: Arachnid monster with venomous fangs. Reaper Miniatures - Warlord / Darkspawn - Isiri Arachnid Archer / Bones - Arachnid Archer: If you don't mind the bow. Nightmare: They mount 6 legged steeds that can Fly. Evil mounted knights: They have mounts with less legs than needed, but they still look good enough. Planar Apparition: They flicker in and out of existence. Shadow Hulk: Transformed cyclops, covered in sores and mutations, with hands of fleshless lumps of solid bone. Safari Ltd - Cyclops: As a base for the miniature. Terror: Transformed Kraken, now a grotesque mass of blubber and slime. Portal of Despair : A rip in the fabric of reality. The edges look like writhing black snakes. Banshee: The ghost of an elven mage queen. It can Fly. Horror: Transformed dwarven stone priest, now freakish and malformed. Petersen Games - Cthulhu Wars - Undead: Perhaps a bit too tall for a dwarf. Winged imp miniatures: Although a Horror can't fly, these look like a good fit. Shade: It's a fused pair of phantoms, that are able to Fly. Their look shift between melted faces, flickering lights and vapour of blood. The Dream Hunter: It feeds on the dreams of the living. Void Lurker: It can take any shape that will best help it. Huge chaos monster miniatures: They will be a bit short for a height 4 monster, but they could be used. Kromlech - Demons - Morbid Beast "Chimney" (KRM078): 45mm high. Panda Fries: Toy dinosaurs: Showcase article about scratch-built miniatures, using toy dinosaurs and lizards. Salamander Prime : Large lizard-like humanoid creature, that produces heat. Warrior with one-handed melee weapon and shield. Salamander Prime with two handed weapon : Large lizard-like humanoid creature, that produces heat. Warrior with two hand weapon, and no shield. Salamander Unblooded : Large lizard-like humanoid creature, that produces heat. Young warrior, with one-handed melee weapon and shield. Salamander Ancient : Large lizard-like humanoid creature, that produces heat. Veteran warrior with one-handed melee weapon and shield. Salamander Ancient with two handed weapon : A Salamander Ancient (large lizard-like humanoid creature, that produces heat; veteran warrior) with two hand weapon, and no shield. Salamander Ceremonial Guard : Large lizard-like humanoid creature, that produces heat. They fight in phalanx formation. Corsairs : Large lizard-like humanoid creature, that produces heat. They use pistols. Many of them are female. Ghekkotah Warrior : Lizard-like humanoid creature with one-handed melee weapons. Ghekkotah Hunter : Lizard-like humanoid creature with blowpipes. Ghekkotah Hunter with Bow : Lizard-like humanoid creature with bow. Ember Sprite : Small (height 0), mischievous proto-elementals, summoned from bubbling fire pits. Tyrant : Large, muscled brute lizard-like humanoid creatures. Fire Elemental : Magical energy beings, taking the form of warriors of fire and lava. Salamander Kaisenor Lancer : A large lizard-like humanoid creature, that produces heat, riding a huge biped carnivore. Warrior in light armour, with spear. Ghekkotah Skyraider : Lizard-like humanoid creatures, riding a flying creature. It that can shoot blowpipes. Ancient on Rhinosaur : Salamander Ancient (ancient, large lizard-like humanoid creature, that produces heat;veteran warrior) riding a large, rhino-like lizard mount. Lekelidon : Large (height 2) spitting lizard, prodded into battle by Salamander handlers. Greater Fire Elemental : Molten behemoth (height 4), leaving a trail of smouldering destruction in their wake. Fire Drake : Large (height 4) lizard. Lithe, tempestous creature. Ankylodon Battle Platform : A moving platform (height 4), crewed by Ghekkotah warriors with blowpipes. Ankylodon Battle Platform with Fireball : A moving platform (height 4), crewed by Ghekkotah warriors with fireball throwers(?). 50x100mm base. Komodon : Living, moving giant (height 4) artillery, that spit gobs of poisonous bile over great distances. Games Workshop - Warhammer Fantasy Battles - Seraphon - Salamanders ? Games Workshop - Warhammer Fantasy Battles - Seraphon - Razordons ? Clan Lord : A large lizard-like humanoid creature, that produces heat. Supreme commander. Clan Lord with Fireball : A Clan Lord (large lizard-like humanoid creature, that produces heat; supreme commander), that can shoot Fireballs. Battle-Captain : A large lizard-like humanoid creature, that produces heat. Trusted deputees, leading large devisions. Mage-Priest : A large lizard-like humanoid creature, that produces heat. Herald : A large lizard-like humanoid creature, that produces heat. Firebrand : A large lizard-like humanoid creature, that produces heat. They use pistol. Ghekkotah Clutch Warden : A large lizard-like humanoid creature. Big and brave ghekkotah, but still smaller than a Salamander Prime. They use blowpipes. Ghekkotah Clutch Warden with Chamelon Cloak: A lizard-like humanoid creature. Big and brave for a ghekkotah, but still smaller than a Salamander Prime, wearing a magical cloak. They use blowpipes. Clan Lord on Kaisenor Raptor : A Clan Lord (large lizard-like humanoid creature, that produces heat; supreme commander), riding a lizard mount. Herald on Kaisenor Raptor : A large lizard-like humanoid creature, that produces heat, riding a lizard mount. Mage-Priest on Kaisenor Raptor : A large lizard-like humanoid creature, that produces heat, riding a lizard mount. Battle-Captain on Rhinosaur: A large lizard-like humanoid creature, that produces heat. Trusted deputees, leading large devisions, riding a large rhino-like lizard mount. Ghekkotah Skylord : They fly, and they use blowpipes again enemy targets. Clan Lord on Fire Drake : A Clan Lord (large lizard-like humanoid creature, that produces heat; supreme commander), riding on a Fire Drake. Clan Lord on Winged Fire Drake : A Clan Lord (large lizard-like humanoid creature, that produces heat; supreme commander), riding on a winged Fire Drake, that can fly. Games Workshop (Forge World) - Warhammer Fantasy - Carmine Dragon: It has no rider. Salamander Veteran : Large lizard-like humanoid warrior, that produces heat. Veteran warrior. Villein Spearman: Human warrior with spear. Villein Bowman: Human warrior with bow. Order of the Brotherhood: Heavily armoured human warrior, riding a horse. Order of the Abbysal Hunt: Lightly armoured human warrior, riding a horse, wielding a great sword or a hammer. Order of Redemption: Human warrior, wearing a special heavy armour, riding a horse. Villein Initiates: Heavily armoured human warrior, riding a horse. Villein Reconnoiterers: Lightly armoured human warriors, riding a horse. Order of the Forsaken: Heavily armoured human warrior, riding a winged beast. Mounted knight: You'll need to add wings to them. Greater Water Elemental: Towering behemoth, aqueous giant. Mummy: The embalmed corpse of an ancient prince. Revenant: Reanimated remain of an elite fighter with good equipment. Revenant with two-handed weapon: Reanimated remain of an elite fighter with good equipment and a two-handed weapon. Skeleton Warrior: Skeleton with a one-handed melee weapon. Skeleton Spearman: Skeleton with a spear. Skeleton Archer: Skeleton with a bow. Skeleton Crossbowman: Skeleton with a crossbow. Swarm*: A swarm of locusts, desert beetles, and other unpleasant creatures. Revenant Worm Rider: A revenant (reanimated remain of an elite fighter with good equipment), riding a sand worm. The Herd - Hunting animal: An animal companion. Tribal Warrior: A Faun, Satyr or similar creature, equipped with light armour, a one-handed melee weapon and a shield. Spirit Walker: After drinking potions, they don't care about their lives, just about defending their land. Tribal Spear: They use spears. Hunter: Lightly armoured fighter, using throwing weapons. Hunter with bow: Lightly armoured fighter, using a bow. Longhorn: A big, bulky and powerful beastman elite warrior. Harpy: Bestial, bird-like, flying creature, with the head and upper torso of a woman. Lycan: Merged man and wolf. They are one with nature. Werewolf miniatures: As beasts of Nature, these are probably not very fitting. Guardian Brute: A Minotaur, an Owlbear or other powerful beastman, with natural weapons and armour or equipped with brutal weapons and a wooden shield. Beast Pack*: Lions, wolves, brocks, or other beasts of the wild. Centaur Longmane: A centaur without clumsy armour. Centaur Bray-Hunter: A centaur without armour, armed with a bow. Games Workshop - Warhammer Fantasy - Beastman - Centigor: Add bows to them. Stampede*: Wild horse, steppe rhino, cattle. Giant Eagle*: Mighty bird of the mountain. Tribal Chariot: The most skilled Warriors and Hunters (equipped with a bow) pair together to ride it. 50x100mm base. Brutox: Part giant or cyclops, towering beasts. Chimera: A bizarre combination on animals. Games Workshop - Warhammer Fantasy - Chimera: It has wings. Chimera with wings: A bizarre combination on animals, that can fly due to its wings. Great Totem : Tall, wood-carved monument, often in the form of heroes or animals. 75x75mm base. Tracker: The best hunter, armed with a bow. Tribal Totem Bearer: The keeper of the tribe's history. Lycan Alpha: Fast and powerful beings. Guardian Champion: The biggest and bravest of the Guardian Brutes (a Minotaur, an Owlbear or other powerful beastman, with natural weapons and armour or equipped with brutal weapons and a wooden shield). Centaur Chief: A leader of the Centaurs. Centaur Chief with bow: A leader of the Centaurs, armed with a bow. Tribal Totem Bearer on a Mount: The keeper of the tribe's history, riding a mount. Avatar of the Father : A manifestation of power, taking the shape of a huge animal. Avatar of the Father with wings : A manifestation of power, taking the shape of a huge animal. It can fly with its wings. Prodos - AvP - Aliens: Infants and Warriors could make good Naiads, but they need to be equipped with weapons. Naiad Ensnarer: Lithe and graceful fishman scout. Human-sized Elf miniatures: Probably painted as sea elves. Naiad Heartpiercer: Lithe and graceful fishman scout, armed with a harpoon-gun. Games Workshop - Warhammer Fantasy - Goblin: As the base of the miniature. Games Workshop - Warhammer 40.000 - Gretchin with Blunderbuss: Add a spear to the gun. Games Workshop - Warhammer 40.000 - Kroot with rifle: Add a spear to the gun. Nokken: Small water demons. They swarm around their victims and drown them. Placoderm: Fishman warrior with bony plates, armed with a trident or a pike, having a tough, natural scale mail and a shield. Placoderm with two-handed weapon: Fishman warrior with bony plates, armed with a two-handed weapon, having a tough, natural scale mail. Reaper Miniatures - Dark Heaven Legends - Tiik Warriors (03616): You need to add a two-handed weapon. Reaper Miniatures - Bones - Tiik Warrior (77186): You need to add a two-handed weapon. Reaper Miniatures - Bones - Tiik Champion (77187): You need to add a two-handed weapon. Reaper Miniatures - Dark Heaven Legends / Bones - Tiik Baron (03759 / 77212): You need to add a two-handed weapon. Reaper Miniatures - Warlord - Chhaya, Sergeant (14454): Armed with a harpoon. Riverguard: Frogman warrior, armed with throwing weapons and a shield. They can leap large distances and have poisonous attacks. Riverguard with two-handed weapons: Frogman warrior, armed with a two-handed weapon. They can leap large distances and have poisonous attacks. Thuul: Ferociuos and slippery tentacled creature, bizarre mix of halfling and octopus. Depth Horror: Horrifying creature with ravenous hunger, living in submarine caves. Petersen Games - Cthulhu Wars - Undead: Probably some additional tentacles would be fitting. RN Estudio - Fantasy Football - Sharky + Ball: Ca. 50mm high. RN Estudio - Fantasy Football - Crab: Ca. 60mm high. RN Estudio - Fantasy Football - Poseidon + Ball: Ca. 60mm high. Gigas: Crustaceans with pincer-like claws and natural protection. Naiad Wyrmrider: Lithe and graceful fishman scout, riding a supernatural sea serpent. Wyrmrider mount proxy: While not sea serpents, they could be used. Coral Giant: Living embodiment of the ocean. Silent killer, its massive fist smashes its opponents. It pauses to knit back its body. Knucker: Water wyrm with natural camouflage, lightning fast predator. Placoderm Defender: Fishman warrior with bony plates, having a tough, natural scale mail. A stoic champion. Placoderm Defender with two-handed weapon: Fishman warrior with bony plates, armed with a two-handed weapon, having a tough, natural scale mail. A stoic champion. Reaper Minatures - Bones - Tiik Champion (77187): You need to add a two-handed weapon. Depth Horror Eternal: Ugly, horrible brute, hungry for fresh meat. Mantic Games - Kings of War - Ghoul: Not very fitting, as the units are not undead, but living cannibals, and the miniatures have them impaled on spikes (that must hurt a living creature a lot). Mantic Games - Kings of War - Zombie: Not very fitting, as the units don't carry weapons, but the miniatures do. For 3 torsos there are 4 right hands, and only 2 of them is empty. CoolMiniOrNot - Zombicide - Zombies: As most of them have modern clothes, you'll need some work to fit them into fantasy armies. Werewolf: A huge wolf-hybrid, with speed and strenght beyond mortals. Lykanis: Feral leader of the werewolves. Viñetas y miniaturas: Ejército Night-Stalker para Kings of war (in Spanish): Article about model suggestions for Night Stalkers. Mantic Forum: [SALAMANDERS - MODEL SUGGESTIONS]: Forum about model suggestions for Salamanders. Mantic French Community: Equivalence figurines KoW Warhammer Hommes Bêtes = La harde (in French): Forum about model suggestions for the Herd. Mantic Forum: [THE HERD - MODEL SUGGESTIONS]: Forum about model suggestions for the Herd. Mantic Forum: [THE BROTHERHOOD - MODEL SUGGESTIONS]: Forum about model suggestions for the Brotherhood. Mantic Forum: [THE VARANGUR - MODEL SUGGESTIONS]: Forum about model suggestions for the Varangur. Mantic Forum: Alternative Models for Basileans: Forum about model suggestions for the Basileans. Mantic Forum: [RATKIN - MODEL SUGGESTIONS]: Forum about model suggestions for the Ratkin. Mantic Forum: Night Stalkers - Miniature Suggestions: Forum about model suggestions for the Night Stalkers. DakkaDakka: Nightstalker Models? : Forum about model suggestions for the Night Stalkers. Mantic Forum: The Trident Realms of Nertica - Miniature suggestions. : Forum about model suggestions for the Trident Realms. Mantic Forum: [THE LEAGUE OF RHORDIA - MODEL SUGGESTIONS]: Forum about model suggestions for the the League of Rhordia. Mantic Forum: [THE EMPIRE OF DUST - MODEL SUGGESTIONS]: Forum about model suggestions for the Empire of Dust. Do you have further ideas for miniatures to be used as Kings of War units? Did I make a mistake somewhere? Tell your opinion in the comments!